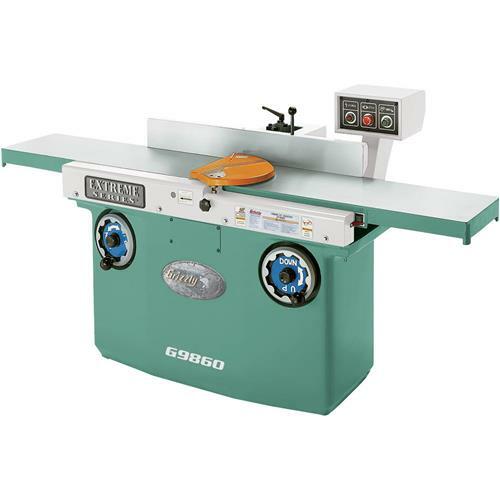 The G9860 Ultimate 12" Jointer is another member of our "Money-No-Object" jointer line and is loaded with industrial features. The close-tolerance beds have been ground and hardened to endure decades of use. The centrally mounted fence assures accurate edge jointing and the large beds will make face planing a pleasure. The handwheels deliver exact control over table movement, making adjustments almost effortless. Its massive weight of nearly 1200 lbs. guarantees smooth operation and a lifetime of satisfaction. And remember, a jointer this size can actually save money by turning unusable "cupped" lumber into perfectly flat stock. 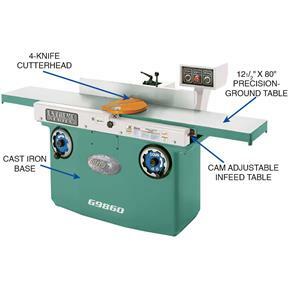 Table size: 12-1/2" x 80"
Floor to table height: 30-1/4"
Knife size: 12" x 1-3/16" x 1/8"
Maximum depth of cut: 5/16"
Maximum width of cut: 11-13/16"
Fence is center mounted, positive stops at 45, 90, and 135 deg. I received my Joiner several weeks ago but just today got the shop wired to get it running. I live in a residential neighborhood but was able to get the massive crate off of the liftgate with a electric hydraulic pallet left. I placed it on a cart and wielded up my driveway and into the garage without incident. After uncrating everything was perfect. The oil preservative was easy to wipe off with a large bath towel. I didn't use any solvents just wiped it and buffed it. Since I just moved in to my residence it took me awhile several weeks before I was able to get it wired up. It's the smoothest machine I've owned to date. Very quiet and zero vibration. I didn't take much time to set the outfeed table, but despite that I got perfect glass Smooth Cuts. I jointed some pieces of oak and walnut and couldn't be happier. It may be a while before I can give it a really good workout as my dust collection system is on the floor and not yet installed. But so far I am really delighted with this purchase. My only negative comment would be with customer service. For some reason the gentleman that answers the phone every time I call is probably the worst person I've ever spoke with on a customer service line. In fact I talk to him before my purchase and almost bought another brand because of his inability to answer questions and his inability to be helpful. Every issue I called him about I had to resolve on my own. I'm not trying to be nitpicky but if I owned a business and I didn't want to be bothered with people calling customer service, then this is the guy that I would have answering the phone. In short order no one would call with questions.1-15-18 Update...I have contacted customer service a few time since my original purchase and have talked with other agents and they were all top notch!!! Machine is excellent! Replaced Hammer with G9860 in professional woodworking shop. Very happy with performance, works as promised by specification. On time delivery, easy setup.